An unaltered photocopy of your DD-214, WD AGO or NGB-22. 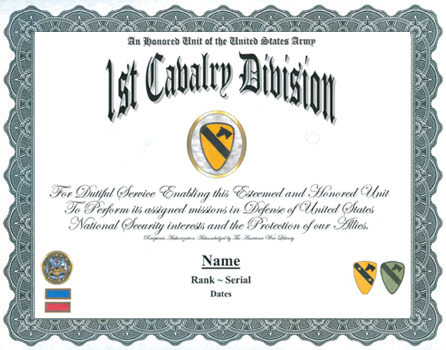 If your service with the 1st Cav is not displayed on your DD-214 you must provide a copy of your DD-214 -AND- a copy(s) of any military-issued clearly displaying your service with the 1st Cav Division. The 1st Cavalry Division, a major subordinate command of the US Third Mobile Armored Corps, is a 16,000 soldier, heavy armored division stationed at Fort Hood, Texas. As one of the two "on-call" heavy contingency force divisions of the Army, the First Team has an on-order mission to deploy by sea, air or land to any part of the world on a short notice. The early history of the organic units assigned to the 1st Cavalry Division following its constitution and activation in 1921 at Fort Bliss, Texas was closely tied to the movement of people and trade along the Oregon and Santa Fe Trails. These routes, a result of perceived "manifest destiny", extended the domain of the United States into the far reaches of a largely unsettled territory. More and more wagon trains loaded with settlers, rolling west, were being attacked by Indians. The Army, having large areas of territory to protect, established a number of military posts at strategic locations throughout the West. These outposts were staffed with a fast, mobile and high spirited strike force of cavalry troops to provide protection along these arteries of emigration and commerce. The 1st Cavalry Regiment was preassigned to the 1st Cavalry Division on 20 August 1921 - nearly a month before the formal divisional activation date. The roots of the 1st Cavalry Regiment extended back to 1833, when it had been organized as the United States Regiment of Dragoons. Three years later, when two more dragoon regiments were created, it became the First Regiment of Dragoons. "Cavalry" became an official branch of the United States Army in 1855 with the creation of the 1st and 2nd Cavalry Dragoons. In 1861 the designation of the units was changed to Regiment and three additional regiments, the 3rd, 4th and 5th were assigned to the Cavalry Forces, bringing the total mounted cavalry organizations to 5 regiments. In 1866, soon after the end of the Civil war, Congress initiated action to expand the number of cavalry regiments. The sound of the bugle and the cry of "Charge" sent the thundering hooves of the U.S. Cavalry troopers to protect the western bound settlers in an era when Indians roamed the western frontier and pioneering settlers clung to their land with determination. The 1st, 7th, 8th and 10th Cavalry Regiments, which in the future would form the nucleus of the 1st Cavalry Division on 13 September 1921, clashed with the Sioux, Comanche, Arapaho, Apache and the Indian Nations during the Indian Wars. Led by colorful characters like Colonel George Armstrong Custer, the next ten years were as eventful as the Civil War. Other units initially assigned to the 1st Cavalry Division in 1921, included the 82nd Field Artillery Battalion (Horse), the 13th Signal Troop, the 27th Ordnance Company, Division Headquarters, the 1st Cavalry Quartermaster Train which later became the 15th Replacement Company and the 1st and 2nd Machine Gun Squadrons. Major General Robert L. Howze was assigned as the first division commander. 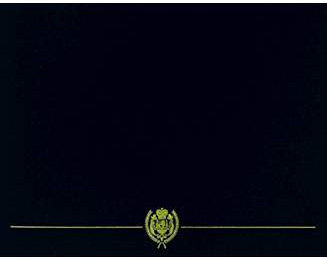 The 5th Cavalry Regiment was assigned on 18 December 1922, relieving the 10th Cavalry Regiment. The 12th Cavalry Regiment would be assigned to the 1st Cavalry Division on 03 January 1933, relieving the 1st Cavalry Regiment. It would not be until 01 November 1957, when elements of the 4th Cavalry Regiment, 4th Battle Group and the first element of the 9th Cavalry Regiment, the 1st Squadron, would be assigned to the 1st Cavalry Division in Korea. The division went home in 1965, but only long enough to be reorganized and prepared for a new mission. Within 90 days of becoming the Army's first air mobile division, the First Team was back in combat as the first fully committed division of the Vietnam War. Their first real combat test came during the Pleiku campaign ; 35 days of continuous air mobile operations beginning October 29, 1965. The troopers destroyed two of the three regiments of a North Vietnamese Division, earning the first Presidential Unit Citation given to a division in Vietnam. The division began 1968 by terminating Operation Pershing, the longest of the 1st Cav's Vietnam actions. For nearly a year the division scoured the Bong Son plain, An Lo valley and the hills of coastal II Corps, seeking out enemy units and their sanctuaries. When the operation ended on January 21, the enemy had lost 5,401 soldiers and 2,400 enemy soldiers had been detained. Some 1,300 individual and 137 crew served weapons had been captured or destroyed. Moving to I Corps, Vietnam's northern most tactical zone, the division set up Camp Evans for their new base camp. In late January, the enemy launched the Tet Offensive, a major effort to overrun South Vietnam. Some 7,000 enemy, primarily well equipped, crack NVA regulars blasted their way into the imperial city of Hue and Quang Tri, the capital of Vietnam's northern most province. The Cav went on the move and by February 1, Quang Tri was liberated followed by Hue. After shattering the enemy's dreams of a Tet victory, the 1st Cavalry Division "Sky-troopers" moved to relieve the besieged Marine Base at Khe Sann. In May 1970, the First Team was "First into Cambodia," hitting what was previously a Communist sanctuary. Troopers deprived the enemy of much needed supplies and ammunition, scattering the enemy forces. The division's Vietnam service ended in 1972 when its last brigade began withdrawing. The 1st Cav had been the first division to go, and the last to leave. "Firsts" had become the trademark of the First Team. General Creighton Abrams, while commander of all U.S. Forces in Southeast Asia, said of the 1st Cav, "The big yellow patch does something to an individual that makes him a better soldier, a better team member, and a better American than he otherwise would have been." The current capability of the 1st Cavalry Division has been developed over its long history. It is the combination of the experienced training received by each dedicated member and organizations of the First Team and their adherence to the performance level and traditions of the past.